Saturday Sep. 16 1944 10. o’c P.M.
Tonight we put back our clocks one hour so that we are only one hour in advance of G.M.T. Pips were broadcast at 9 o’c as Big Ben was going to be put back. It is a memorable day in most of Eng. as it is the end of total black-out. Our area is not included tho’, as we are on the coast and our black-out must remain total at present. I wonder if it would not be better if it was kept up every-where for a time. The cartoon in D.M. [Daily Mail] depicts a warden knocking at a door and informing the inmates that they have “no light showing” the house being blacked-out and its neighbours windows glowing thro’ ordinary curtains. I have stopped my clock. When the hour is up, (9.45) we shall go to bed. It will be nice to have an extra hour of daylight, (and rest) in the morning. Just lately I have been very sleepy at 7. a.m. which is not usual. Tonight Jean and I went to see Mr Mc.Cullam re typing etc. He is not taking any more pupils, as he finds it too big a strain. He is getting on in life. He recommended a Miss Cusac? at Skegness. Jean then went to Toc. H dancing-class, I am not much in favour of it. Jean objects to P.Hs dancing. I took flowers to the churchyard, I really had a nice bunch out of our garden to-day. Pink and mauve asters, larkspur, and purple spike for the brown jar and red antirrhin[ums] and dahlias for the other, I put a few on Mark’s mem[orial]. It was 27 years on Wed Sep. 13 since he was “killed in action”. It was lovely weather not like this wet cold summer. He was 21 so would have been 48 now. “They shall not grow old, as we that are left grow old.” “We that are left”. Grandma has seen 4 of her 5 sons go before her. Jean went to see her tonight as I thinking I should be home first took the key and she did not know where I was. She says G.ma has a very bad cold. Rene hasn’t been to-day as there has been a Red + garden fete. Jean and I pulled a lot of the sweet apples to-day as birds and wasps and flies are eating them on the trees. Some of them are very big and a lovely colour. I cleaned out rabbits and put a partition in young ones cage. I wonder if they will knock it down. Have collected grass off dyke-side for food and bedding, a good thing we got it yesterday as I saw Short collecting the rest of it. Coote mowed it. Have severely pruned? the veronica or more probably, box privet, shall most like likely saw it off by the ground as I think it will shoot out again. Must keep it under control then. Hope the grass seed will soon be up, it was sown last Mon. I also chopped a piece off the privet hedge by the gate so that we have a way on to the bank to mow dyke bank and trim the hedge and clear up. I can’t climb under bridge and don’t think it’s necessary. If the Council should object they can’t very well put it back and I intend seeing it doesn’t grow any more, it was only one root I destroyed, at least I have destroyed the top and hope the root will die with a little help. It is after 9.30 by B.S.T. so think we may soon start the clock and go to bed. Planes are going over, fly-bombs came over S. and Lon. again last night after 2 weeks rest. They were probably launched from pick-a-back planes. Evacuees who insist on pouring back would get an unpleasant reception. The govt. keeps warning them not to return as it is not safe yet and so many houses are down or unfit for habitation. This Diary entry was the first of the final series of entries, found on loose sheets of paper. 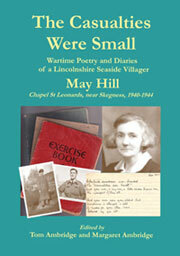 Earlier entries had been in ‘school’ exercise books which usually began and finished with a short rhyming verse. The loose sheets, as well as two ‘missing’ books and many of May’s poems, were discovered amongst the possessions of Ron’s wife Emmie after her death in 2007. 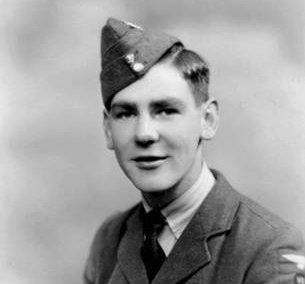 Alfred Henry McCullam, approached for typing tuition, lived near the chapel in Hogsthorpe. He was believed to have been a schoolteacher. Miss Cusack was a typing and shorthand tutor in Skegness. May was unsure of the spelling when first written here. 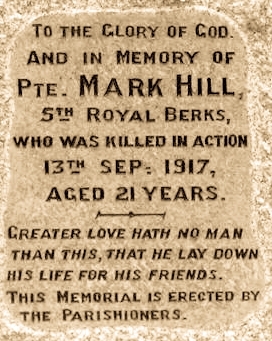 Mark Hill, the youngest brother of May’s husband Will, was the only man of the village to be killed in action during the First World War. 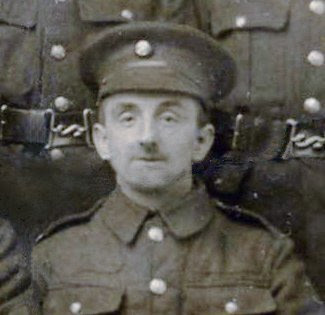 A private soldier in the 5th Royal Berkshire Regiment, he fell on 13th September 1917, aged 21, on the front line at Monchy, near Arras, France. 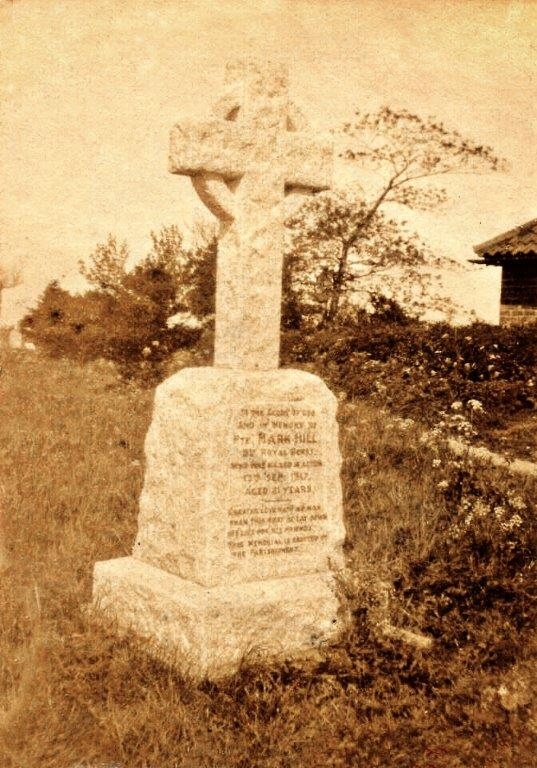 The war memorial in the grounds of St Leonard’s Church was erected in his honour by the villagers and bears the inscription shown in the photograph. His name is also recorded on the Arras memorial, near to the battlefield. 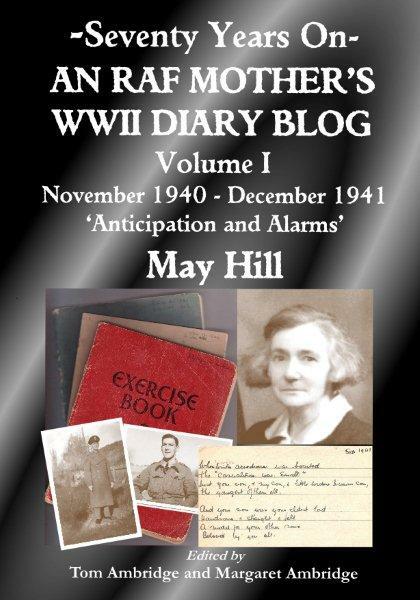 Charles (Charlie) Hill (see 16 December 1940) was the only surviving son of Annie Hill (‘Grandma’) after the death of Will.